Has anyone managed to reverse hair loss caused by accutane? http://www.change.org/petitions/tell-roche-pharmaceuticals-give-us-the-truth-about-accutane PLEASE SIGN THE ABOVE PETITION. TELL YOUR STORY. I've been on accutane for about a month and a half now. During my first month my derm started me off with 40mg once a day and all i noticed was dry skin, and dry lips. 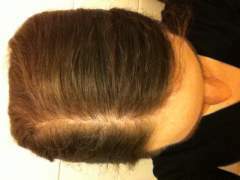 After my second visit my derm told me to move up to 40 mg twice a day (80mgs) it is my third week into my treatment and I started to notice that my hair has been getting thinner in the back of my head. Is this normal? Should i be taking vitamins to help prevent hair loss? Hairloss On Women Post Accutane? Hi!! I've been on Accutane for 4 months. I heard that not just men, but women too can have hairloss a few months after finishing Accutane, and that sometimes it can be permanent. What's the probability of hairloss on women post Accutane? I haven't lost any hair since I started, but I'm worried about the next months and after... Thx! Low Dose Accutane... And Symtoms And Benifits ( Hairloss Mainly )? Going off Diane 35, starting Accutane -> How and when? Extremely Oily Dehydrated Face, eyebrows hairloss. Ok, so i started accutane 2 weeks ago, on 20mg a day. Today I have started to alternate between 20 and 40mg /day and in two weeks start 40mg/day. 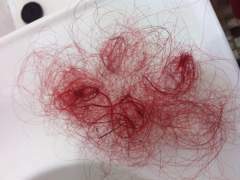 I was just wondering what are the chances of losing hair and does it come back after treatment? I've been reading some pretty scary stuff on the side-effects. It's one of my most concerned side effects, as i do attempt to maintain it and style it. Also is there anything i can do to prevent or minimise it? Hair Loss (Eyelashes + Eyebrows) On Accutane? Hi, around 3 and a bit months ago i started Accutane, then when i noticed my hair starting to thin, immediately stopped it 2 and a half months in. From then i start to use Stieva-A, which is the same as retin-A, and i was wondering if there's any chance that a topical ointment could cause hairloss? BTW I'm also using finacea for AM. Will, the retinoid keep my vit-A levels high? and continue the hairloss?